Towards the tail end of corn season several weeks ago, I bought several ears of corn for the family to enjoy. I arrived fairly late to market and it was already slim pickings by then, so I managed to snag only 6 ears. Only 6 ears was not enough for us. When we devour corn, we usually have an ear each, at least. Two ears per person is a modest serving for us. I had to figure out how to stretch these ears of corn lest a riot breaks loose. Hmmm. . . I had some oxtails, some potatoes, and cabbage. Why not make a soup with all of the ingredients above? I must admit in all my years eating soup and eating corn, I've never had corn in soup before. (That is, a soup that had corn in it, instead of a cream of corn soup). There's really nothing in terms of recipe for this soup. It's basic home-cooking, where we put ingredients in a pot with some water and wait. I put the oxtails in the pot first and cooked them in water until they were almost tender, added the potatoes and then the corn. I got some local nugget potatoes because they were also available (and my favourite) and I managed to multiply my 6 ears of corn into 18 pieces of corn, by cutting each ear into thirds. I added some sliced cabbage last. Then, the soup was seasoned to taste. It is surprising how a simple meal like this is so very, very good. The corn were exceptional! Somehow, cooking them with the oxtails made them taste very buttery, very sweet. The cabbage also made the light but definitely beefy broth itself sweet, and of course, the potatoes soaked up all that flavor. 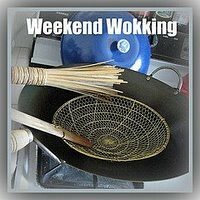 We are submitting this soup to this edition of Weekend Wokking. We're just sad that we couldn't do our usual "crazy" entry for the event. But, hopefully, we'll be able to someday soon, when time frees up. The host this month is Graziana of Erbe in cucina. All quantities are according to how much one wants them to be. In a pot, add oxtail pieces and cover with cold water. Bring the water to a boil, then simmer on low heat until oxtail is tender, about 2-3 hours. Add potatoes and corn into broth. Simmer until cooked. Add cabbage last and cook in the soup until wilted to your liking. Season the soup to taste with salt & pepper, and/or soy sauce, and/or fish sauce. i love corn on the cob in soup; i think the cob adds to the broth. 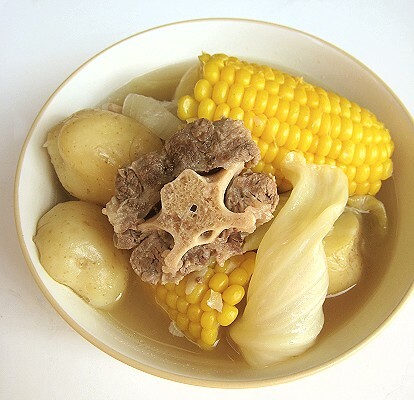 We love using corn in soup, though I usually take it off the cob. I buy it in season, blanch it & freeze it. Its wonderful in chili! Good soup does not need to be complicated. So simple but this looks sooo good right now. I love everything in this soup. 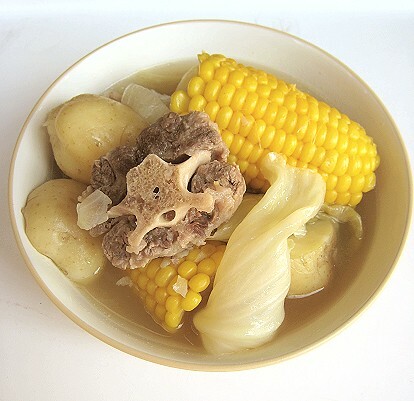 I love corn too, this soup reminds me bolivian picana too. Thank you for sharing this recipe with Weekend Wokking. sorry to be so picky but that looks like a neckbone to me - delicious none-the-less! 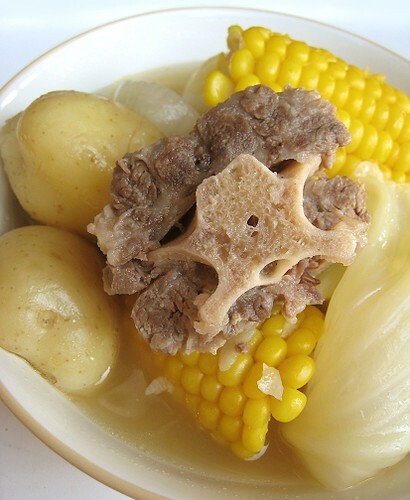 We do this too but with beef bones rather than oxtail and a squeeze of fresh lime. Just had it weekend before last. Good on a chilly cold day. Oh yeah, the whole lot becomes nice and 'sweet'! Oh, PICANA, you say? Let us research that. Oh, trust us, it's oxtail. Although, it's should all kinda look the same, being part of the spine. We'll try the squeeze of lime next time!